The street worked extremely well as a quality high street but the affluence of the catchment provides it with opportunities that less affluent neighbourhoods would be unable to deliver and sustain. 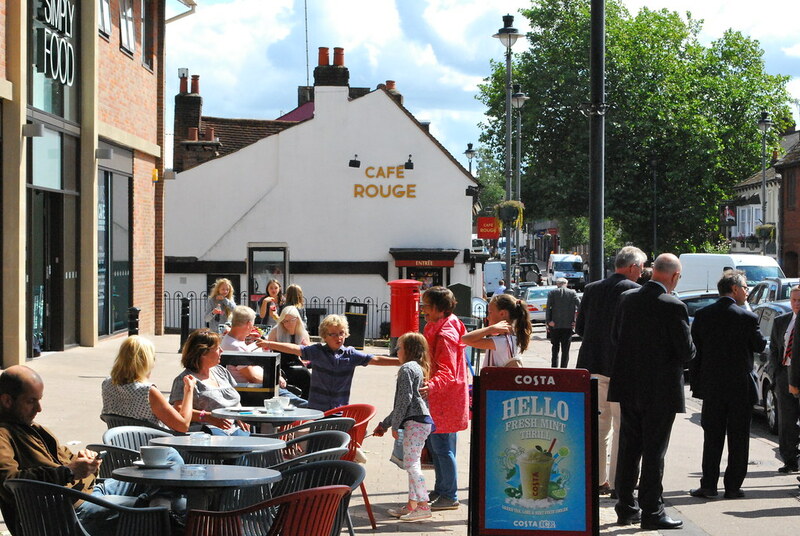 That is not to denigrate the achievement of the council and local community in creating a vibrant High Street in current times but that in itself is not the totality of what makes a great Street. There appears to be very good collaboration and working partnerships between individual businesses and the Chamber of Trade. This was a particularly strong aspect of the street. Investment in a well-designed scheme pays off. Although the scheme was introduced many years ago it has stood the test of time and although if being introduced today, the style and approach might be different in some key ways, the scheme nonetheless continues to serve the town, its community and its businesses well. It would appear that, by any measure, Berkhamsted is a successful town. The High Street has been re-ordered some twenty years ago as a “De-trunking Demonstration Project”, following the construction of a bypass. The town now boasts a new Waitrose a successful Art Deco Cinema with a restaurant and any number of carefully restored ancient buildings set in well-crafted re-configured streetscapes. This ancient town, granted a Royal Charter in 1476, is laid out along a river valley so the main street runs in a straight line the length of the town and is bustling. The High Street project was exemplary for its time, consisting of a series of lateral and vertical interventions (chicanes and speed tables) to encourage motorists to drive slowly. It also includes some interesting features such as loading bays at pavement level constructed in stone sets, which when not in use become pedestrian space; the overall pavement area is greatly increased at the cost of carriageway space and the crossings celebrate key points such as the Civic Centre. The street is further enhanced with tree planting and bespoke street furniture. It has survived reasonably well and continues to deliver its objectives, creating a pleasant shopping environment. Indeed, the centre is a strong destination for people taking advantage of a wide range of specialist shops and numerous cafes, restaurants and pubs, together with the strong supermarket offer. The High street is easily accessible on foot from the rail station and has several cross-cutting pedestrian routes generated by the medieval plan of the town. The street is anchored at one end with a small M&S and at the other by the impressive art deco cinema. The cinema is operated as a community enterprise with a privately operated restaurant in the former foyer. Notwithstanding, it offers limited transferrable learning in high street design or regeneration, it might have been better nominated under a different category because what we saw and heard was about the whole town of which the High St is only a part.